This has always been the view from my room. A pretty walled garden, full of roses. I can’t smell the roses, but that’s actually good, as I can’t stand their sweet smell. But I still like to view the view. Last week, a new person moved in. It’s a lady who likes to paint. She’s now blocking my view! 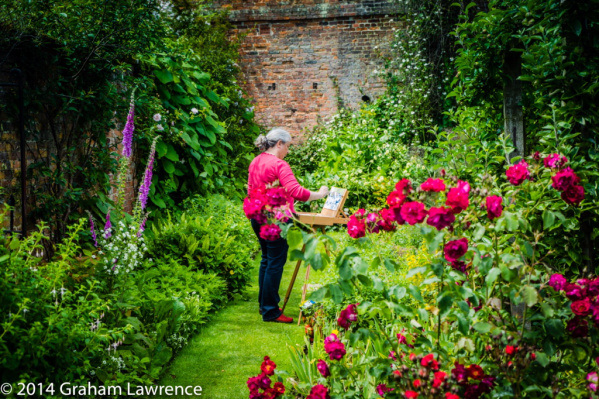 Who does she think she is to block my view like that, standing all day in ‘my’ garden to paint her silly ugly paintings? I’ll file a complaint! That cannot happen! This view is mine and I don’t want it changed! No painting ladies standing on the garden! The nurse comes to check on Bathilda. She seems troubled lately. Ever since a new patient was admitted at the hospice. This post has been written is response to the Flash Fiction for Aspiring Writers, with photo prompt provided by Graham Lawrence, and contains 128 words. To check other stories inspired by this prompt, click the froggie below. How dare she, indeed:P ! It’s almost as though Bathilda doesn’t want another to interpret her last views or be a part of them. Nicely done. The writing flows so smoothly. I love this quite different from all the takes. The character is very intense. Bathilda needs to deal with her anger issues, but very sad that she is in hospice. Maybe that’s why she is angry. Great story! Thank you for participating in Flash Fiction for Aspiring Writers Challenge! Poor Bathilda, she was happy until the lady entered the garden and upset what she thought was a perfect view. Sad that she is ill and the nurse can not understand her frustration. Maybe she will find some way to adjust to it. Great story! Ooh, I like the twist at the end. Just when I was wondering what was up with the narrator, too. I love the twist at the end! A well written story. I love Bathilda’s attitude to this new lady, spoiling her view in the garden. In her head, the garden was for her alone to view. The clever ending makes everything clear.